Hello! Banana! 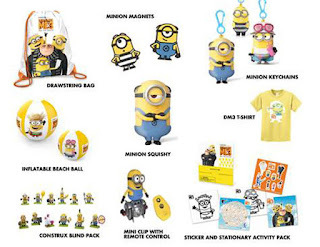 Which is minion talk for Hello and welcome to another awesome contest for Thisfunktional readers. I'm an avid moviegoer and the Despicable Me franchise has been one of my favorites, I even enjoy the Universal Studios Hollywood area and ride. I am anticipating "Despicable Me 3" so much and am beyond excited, that being said Thisfunktional is happy to bring this Father's Day Prize Pack. I will let the winner be surprised when they receive their copy. Disclaimer: 1 winner will be chosen. Contest runs to June 16, 2017 midnight. Winners will be notified on June 17, 2017 with instructions on how to claim your prize. No purchase necessary. Prize provided by H+M Comm. Only open to the U.S., no PO Boxes or international addresses. The team who brought you "Despicable Me" and the biggest animated hits of 2013 and 2015, "Despicable Me 2" and "Minions," returns to continue the adventures of Gru, Lucy, their adorable daughters—Margo, Edith and Agnes—and the Minions. "Despicable Me 3," directed by Pierre Coffin and Kyle Balda, co-directed by Eric Guillon and written by Cinco Paul & Ken Daurio, will be released in theaters on June 30. The animated film is produced by Illumination’s Chris Meledandri and Janet Healy, and executive produced by Chris Renaud. Joining Steve Carell and Kristen Wiig in "Despicable Me 3" is Emmy, Tony and Grammy Award winner Trey Parker, co-creator of Comedy Central’s global phenomenon South Park and the Broadway smash "The Book of Mormon." Shared. Ben messages you on FB! Thanks for the chance.